This is a family favorite, and probably one of the most requested dishes I make. It is just the right amount of salt and grease to be perfectly satisfying, if not the best thing for you. The chicken breasts brown quickly and have a lot of flavor. Before frying, either pound or thinly slice the chicken breasts. Murray’s chicken at Fairway has family packs of thinly sliced chicken breasts so I use them for this dish. It allows the meat to cook quickly and not dry out. Mix the lemon juice, ginger, oils, salt and freshly ground pepper in a small bowl. Place the chicken breasts in a gallon zip-lock bag. Pour the marinade in, squeeze out most of the air and zip shut. Shake or squish the bag around so the chicken gets coated in the marinade. Place in the refrigerator while you prepare your dinner. When you are ready to fry, beat the eggs in a large shallow bowl. To the left of the bowl, place a put a small mound of flour on a chopping board. To the right of the eggs, put a mound of panko on a plate or chopping board (basically you need flat surfaces to the right and left of your eggs). 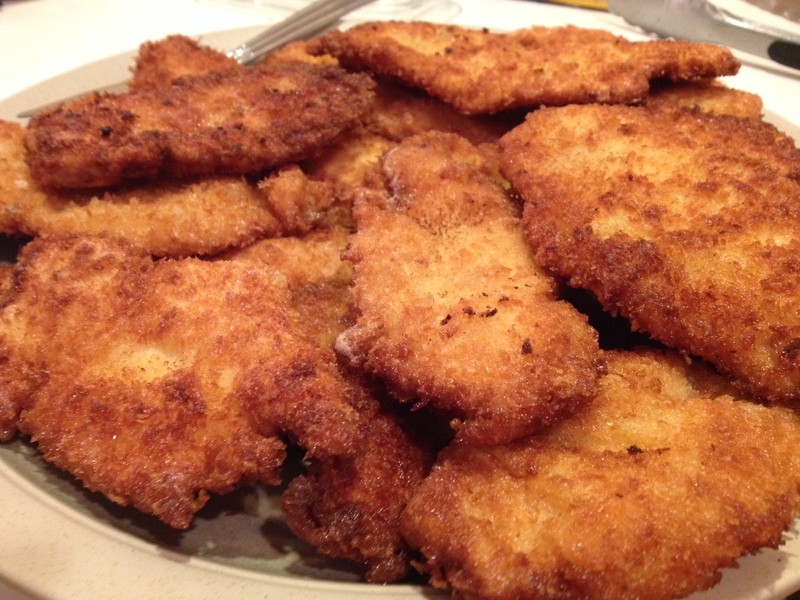 Take a piece of chicken from the bag and coat it first in flour, then egg, then panko. Set aside on a baking sheet or cutting board and repeat with the remaining chicken breasts until they are all coated. Heat about ¼” of oil in a fry pan until hot. Place several chicken breasts in the oil, but don’t crowd. Fry about 3 minutes per side, or until a golden brown. Flip and repeat on the other side. Remove from the oil and drain on paper towels until ready to serve.